Version 1.3.1 – fixed crash with cargo Liebherr LTM1060. 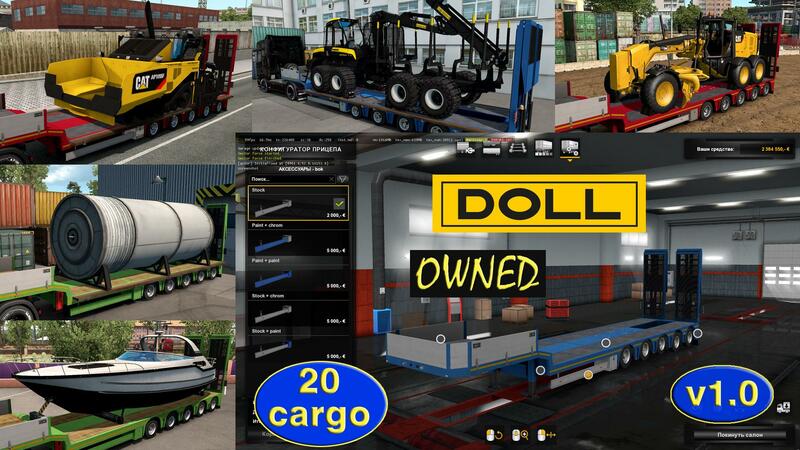 Version 1.3 – added 10 new cargo: tractor New Holland T9.560, airport crash tender Rosenbauer Panther, road roller LiuGong CLG 614H, mower conditioner Krone BigM 500, wood chipper Jenz HEM 583Z, tractor Schluter Super 2500VL, turbine, slurry tanker Kotte Garant VTL, mobile crane LTM1060, telescopic handler Weidemann 4270cx100, fixed cargo definition. Models by Gallinger, Giants Software, Weltenbauer Software, Visual Imagination, PlayWay SA, Cape, Code Horizon.